Located at the top of the Eagle Bahn Gondola in Lionshead is Epic Discovery. Epic Discovery offers activities for all ages and availabilities. 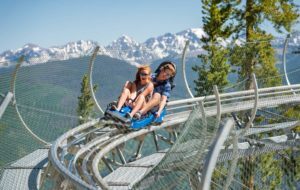 From the alpine coaster, ropes course, zip line, or just the spectacular ride up the gondola for lunch, you can make a day at this mountaintop adventure center. While the kids play, adults can enjoy a beverage and tasty treats at Bistro 14 on their outdoor patio. For a more extensive zip line experience, try the 3-hour tour on top of the mountain and you’ll be zipping on some of the highest and longest zip lines in the country. For more information on adventure ridge and zip lining click here. Defy gravity on a mountaintop trampoline complete with a harness to let you soar high. The thrill of tubing, without the cold! There is also a mini tubing hill for younger thrill seekers. Coast through the forest on an adrenaline pumping alpine slide. Test your balance and problem-solving skills on these fun ropes courses. Courses available for children and adults. Reach new heights on the rock climbing tower. More fun awaits including mountain biking, nature discovery, hiking, and mini golf. Please know that reservations are required for some of the items listed above visit Epic Discovery to learn more. What fun activities will you add to your itinerary this summer?